Thornton Academy's Luke Chessie tallies three points in the win. 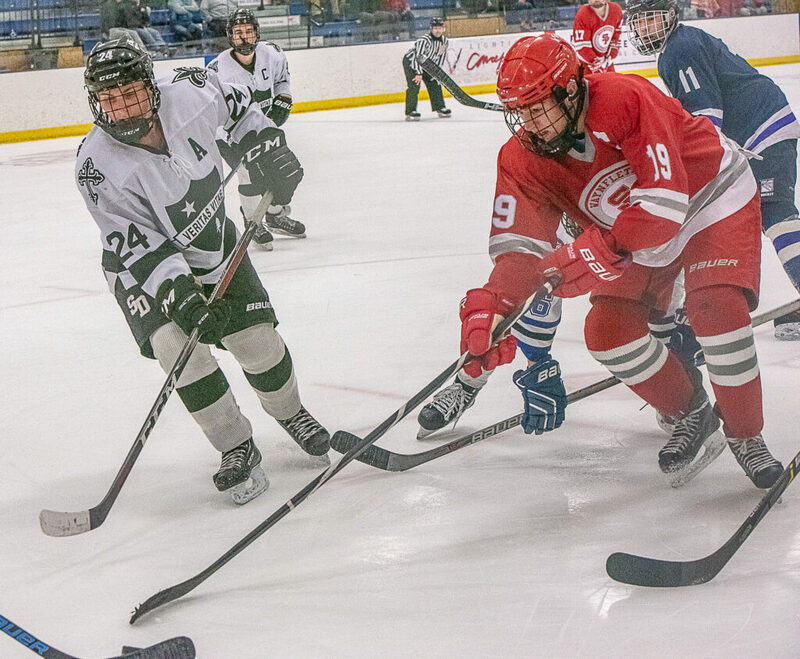 AUBURN — Throughout the Class A boys hockey season the North region had the upper hand on the South, all the way up through North champion St. Dominic Academy beating South champ Biddeford in the Class A state championship game. Saturday night, with the best Class A senior players in the state battling for the last time, the South got its revenge. 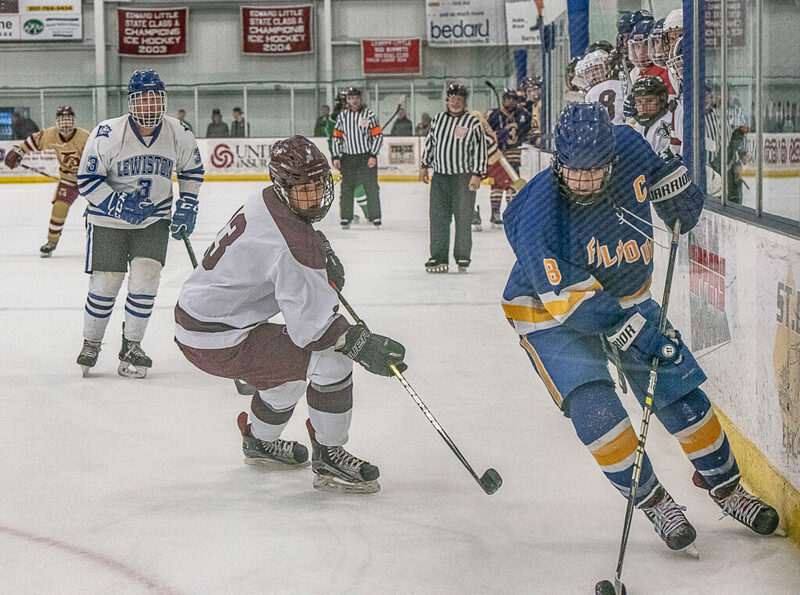 Thornton Academy’s Luke Chessie factored into all three South goals during a 3-1 victory in the Class A senior all-star game at Norway Savings Bank Arena. The North went 27-16 against the South this season, with 10 of those North losses suffered by non-playoff teams. But Lewiston coach Jamie Belleau, who coached the North, didn’t think there was much of a regional disparity. “There were five or six teams in the South on any given night they could beat anybody in the North,” Belleau said. 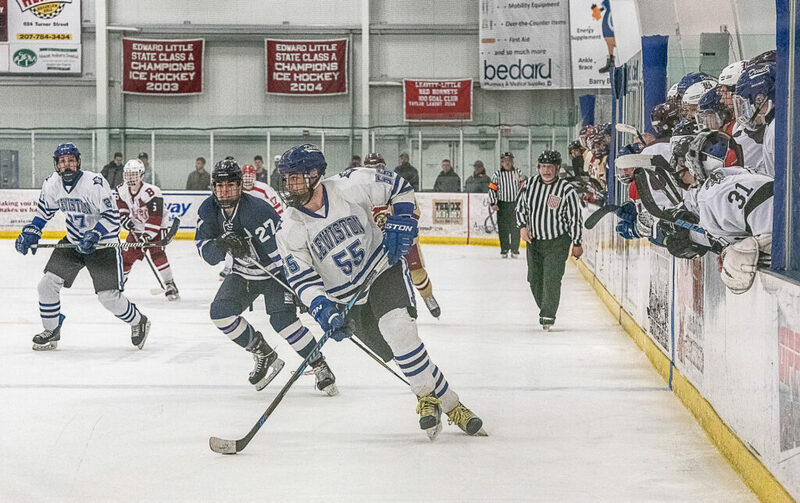 Belleau’s Blue Devils lost twice to South teams, including Thornton Academy. Chessie got the scoring going just 32 seconds into the game, finishing off an assist from Henry Honkonen of Marshwood/Noble/Traip/Sanford. The pair later scored in reverse fashion. Reid Hopkins evened the score with just under four minutes to play in the first period. The Cony/Monmouth/Hall-Dale forward took a breakout pass from Windham/Westbrook’s Derek Corbett and beat Portland/Deering goalie Ben McCallum on a breakaway. Hopkins was named the North’s most valuable player. Goaltending dominated the second period, with Lewiston’s Jacob Smith stopping the first 12 shots he faced for the North, and McCallum and Thornton’s Seth Dube splitting time and combining to make six saves in the frame. Chessie made one of those nice plays on a counter-attack in the final minute of the second, and just when it looked like he might lose his chance at a shot on goal he made a nifty between-the-legs move on a pass to Honkonen, who then went around Smith to put the South up 2-1 with 40.9 seconds to go in the second. Chessie finished off the game with an empty-net goal with 12.3 seconds left in the game. He credited Cheverus forward Colby Anton for making an “unselfish play” with the assist. St. Dom’s goalie Gaston Fuksa made 13 saves in the third before getting pulled during a timeout with 1:13 left. Bangor goalie Jacob Henry made six saves for the North in the first period. Both the South goalies denied Mt. Ararat/Lisbon/Morse/Hyde forward Noah Austin, who earlier in the day won the Travis Roy Award. Chessie was a finalist, so his South MVP performance was a chance for the spotlight Saturday. Henry, as well as Falmouth’s Garrett Tracy and Portland/Deering’s Donato Tocci were also finalists. The three finalists from the South were all out on the ice together during crunch time at the end of the game.